Hiya guys. How's your week so far? I'm definitely missing my lazy days lounging around the house. But even though I'm back at work I'm still feeling highly motivated for nail art. 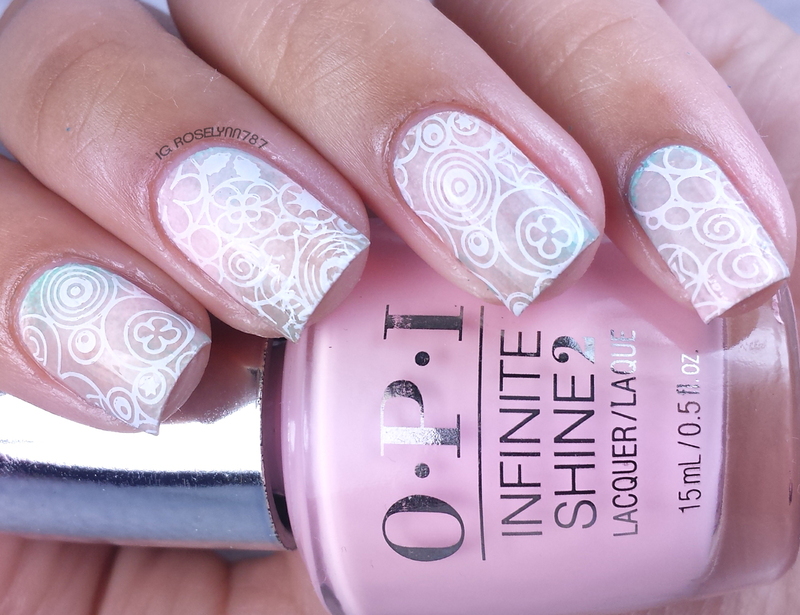 Today I'll be showing you guys another mani I'll be submitting to the Preen.Me OPI Infinite Shine Challenge. You guys can vote for my entry by simply liking the picture on my Instagram account. This is probably one of my favorite manis so far this year. I actually ended up wearing it all weekend and loved every second. It just screams Spring time! All OPI products in this post were received from OPI as part of the PreenMe Program. All opinions stated here are completely my own. The watercolor technique is actually very simple and looks really cool the more colors you use. All you have to is paint your nails with a white base to start. Take a makeup sponge and lightly dab on three to four colors randomly throughout. You can make them blend and overlap for additional colors too. Once you have the desired effect simply roll the sponge across your nail until it is opaque. From here you can either top coat and be done or do some nail art like I did. I have so many stamping plates I don't nearly use enough, so I knew right away that's what I wanted to do over this. 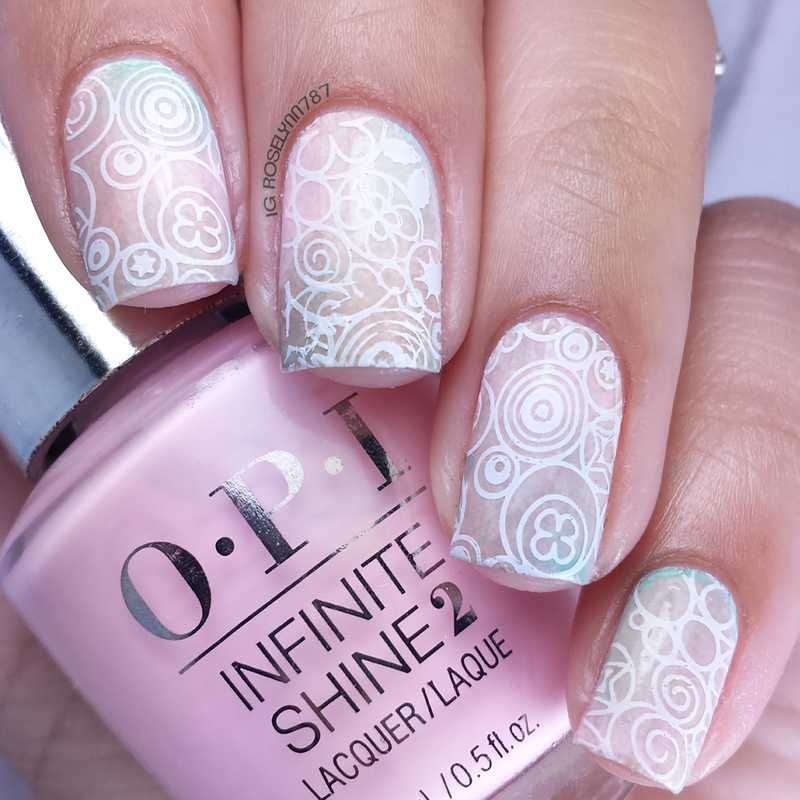 The stamping to me adds a really nice touch and makes me want to try this out in different colors. What do you guys think? As I mentioned before, this is for the Preen.Me Opi Infinite Shine Challenge on Instagram. I would really appreciate if you guys could take a second and vote for me. 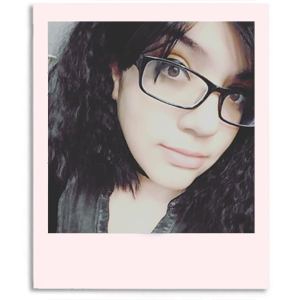 All you have to do is like the photo on Instagram http://instagram.com/p/1d03fWpIXM/. Than you so much for the support! I can totally see why you wore it for so long! It's gorgeous! Thank you! I'm already thinking of doing another one for this weekend lol. Thanks a lot of voting. I was almost afraid the colors wouldn't work together, but so glad I tried it anyway. I want to get married again so I can have these nails!! I didn't even think of these as wedding nails before you said that lol Now I know what I'll wear for my big day next year! 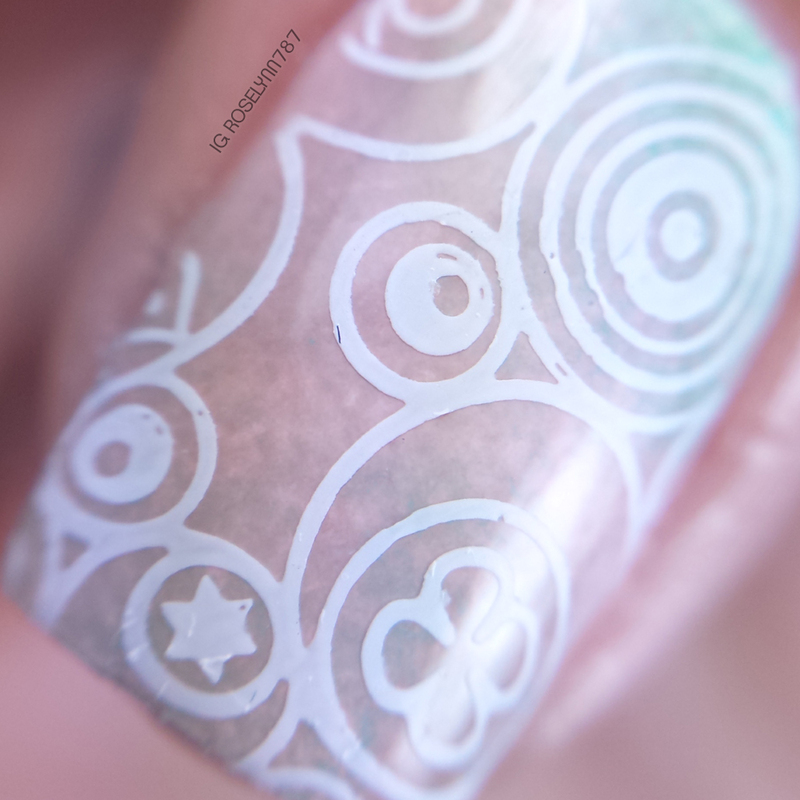 I love the stamping with this - it gives it a nice structure. Aren't your nails just the prettiest <3! I love backgrounds with a bit more interest for stamping, and this is a perfect example. I love this!! Reminds me of cotton candy!!! I also love how the stamp stands out against the base but not enough to take away from the gorgeous watercolored shades!! Definitely going to have to try this out! It's beautiful! I need to try a similar manicure, I love it! So soft and pretty! 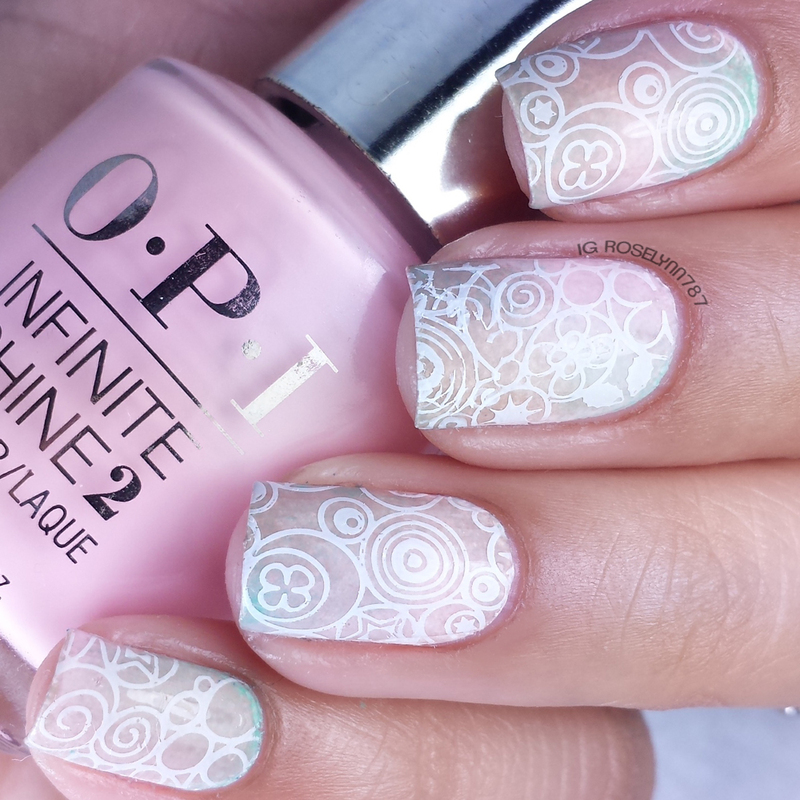 I love that stamping!